Edward Bloom has lived a full and fantastical life, populated by witches, giants, and mermaids, marked by true love that stops time in its tracks, and framed by heroics that push the limits of believability. His adult son, Will, is no longer amused by his father’s fantastical tales, insisting on a rational rather than a fantastical account of one’s life. When Edward’s health declines, and Will learns that he and his wife, Josephine, will have a son of their own, Will decides to find out his father’s “true” life story, once and for all. Big Fish is a heartfelt, powerful, and truly magical musical about fathers, sons, and the stories that we use to define our identities. 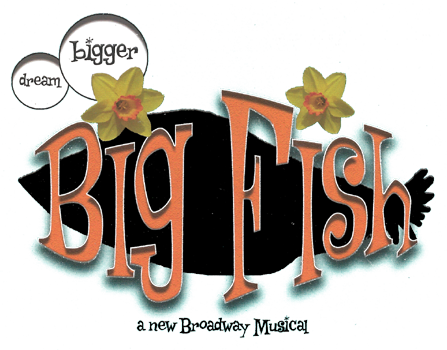 With spine-tinglingly beautiful music and lyrics by Andrew Lippa, and a funny, heartwarming book by John August, Big Fish is a magnificent “big fish” of a tale, itself—spectacular, fantastical, and overflowing with love. Watch promotional video edited by Steffan Scrogan. Edward tells his son Will one of his many adventure-filled stories. Edward first sees his future wife, Sandra. Edward and his friends show young Will how to catch fish with the Alabama Stomp. Edward tells his daughter-in-law one of his stories, while his wife and son react. Sandra and her friends audition to join Amos Calloway’s circus. Edward brings his friend, Karl the Giant, to Amos Calloway’s circus. Edward’s childhood nemesis, Don, confronts the witch. Will and Josephine celebrate their happy news.